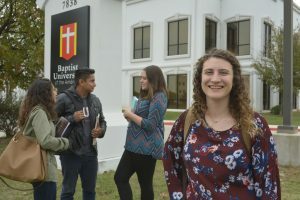 “I came to BUA because I was called here,” reflected Pedro Guerra, a third year student at Baptist University of the Américas. Pedro prayed for two years about what he should do with his life. “God, show me where you want me to go — take me somewhere,” he kept asking. Feeling the pressure every high school senior feels to make a decision about the next steps, Pedro decided to pursue physical therapy at a college near his home town of Runge. His studies were going well, but he felt unfulfilled. “That was the first time I understood that I was being called somewhere,” reflected Pedro. He heard about BUA from his pastor, a BUA alumnus. Pedro decided to transfer to BUA and start pursuing a Bachelor’s Degree in Theology and Human Behavior. BUA recognizes that Pedro, and every student, has been called — to this campus and a future of leadership in various job sectors, countries and contexts. BUA has a holistic approach, focusing on forming students academically, socially, personally and spiritually. “It is a Christian community that helps you grow,” said Pedro. The Called Club is one way students help one another grow. The Called Club is a student-led group that focuses on helping students find and fulfill their individual, God-given calling. The officers are leaders on campus who organize seminars, events and activities, which compliment BUA’s biblical focus and further equip students. Twice a month, the group leads a student evangelism training. The officers also organized and led a chapel service this fall. Jana Atkinson, president of the Called Club, is pictured with fellow BUA students. “Every student is a member because we all have a calling from God,” said Called Club President Jana Atkinson. the future so she can become a professor. Jana explains that she has a heart for educating underprivileged women around the world. BUA is shaping the next generation of cross-cultural leaders. If you are interested in learning more about BUA or enrolling as a student, attend a BUA Open House event this fall. See details and register here.